Create hyper-engaged viewers and bring your products to life with the most powerful product content—video. Add energy and announce everywhere with easy distribution of powerful product videos. Launch confidently with a system that works on every screen, in every channel, including social. Track the impact of your launch with video analytics and integrate with your marketing automation integration. Simultaneously distribute product video campaigns for consistent timing and accuracy. Create invested customers with proven product video marketing techniques. Bring extra buzz to your product launches with live video streaming. Educate customers with video demos to increase retention and adoption rates. Leverage video for in-product and in-app messaging for a deeper engagement. Use custom calls-to-action and end screens within the video player to drive action and involvement. Continually refine your message and results with detailed viewing metrics and insights. Look to video engagement scores to see how well your content is resonating. Use second-by-second viewing data to correct your course mid-campaign. Compare and contrast product video campaigns to improve your strategy. Profile customer data to reveal upsell and cross-sell opportunities. The Brightcove Video Marketing Suite brings together all the video technology you need to create deeper engagement throughout the customer journey. It’s easy to start, easy to use, and drives killer results. When YouTube Isn’t Enough. 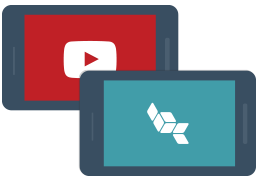 A Blended Distribution Strategy for Video Marketing. Our team can help you streamline your efforts for maximum results.